Tagline – Out of the Wood. Into the City. Story: Christopher Robin starts when Christopher Robin leaves the 100 Acre Wood as he grows up, saying goodbye to Winnie the Pooh and friends, promising never to forget about them, the years flyby and soon Christopher (McGregor) is married to Evelyn (Atwell) with a daughter Madeline (Carmichael), he goes to and returns from war, becoming a businessman needing to make difficult decisions. When Christopher is facing the most difficult time in his life, with his professional career facing dismissing staff and his personal life showing how distant he is becoming from his family, Winnie ends up paying him a visit in London, as he searches for his own friends from 100 Acre Wood. Characters – Christopher Robin is now grown up, not the child we know from the Winnie the Pooh adventures, he is married with his own child and his own responsibilities, he is struggling to balance the two lives showing how his imagination is losing out to the real world. being visited by Winnie, he must look at his life and decide just what is right for him, his family or his career. Evelyn is his wife that has supported him through all his decisions, she is growing tired of Christopher’s actions, deciding what is best for their daughter, Madeline is the daughter that is being pushed down a path that Christopher never did, one with discipline and no imagination. Winnie the Pooh is the lovable bear that loves his honey, he visits Christopher to try and save him from his own misguidance. Performances – Ewan McGregor is fantastic in this leading role, he shows us just how difficult life can be with the balance as we see how he will show the struggle to be a family man or a businessman. Hayley Atwell is good without having to do that much in her role. Bronte Carmichael gives us a good child actor performance. Story – The story shows what happens to Christopher Robin once he grows up and starts to make the same mistakes his own father would make for him. This is a story about needing to learn how to balance a career and personal life to make sure that you enjoy the most part of your own life, bring back the popular figures from the Winnie the Pooh world, it all comes together to make you leave the film with a true smile on your face. This story will connect to people of all ages and play into the love for the Winnie the Pooh characters. Adventure/Comedy/Fantasy – The adventure takes Christopher Robin, Winnie the Pooh and the rest of the gang on the biggest adventure, one that is important to life, not just enjoyment. The comedy connects well through the film, you will be laughing a lot in this film even with it having serious moments in. the fantasy side of the film shows how these colourful characters are real in this world. Settings – The film is set in two main locations, first is London showing how far away from the boy from the 100 Acre Wood has go, the second is the 100 Acre Wood to which will bring the boy out of Christopher. Animation – The animation focuses on just bring the animals into the real world and it does hit very well never looking out of place. Scene of the Movie – The adventure to work. Final Thoughts – This is a delightful film to watch, it is one of the film that will leave you smiling with pleasure and true enjoyment. Plot: A hardened detective in the Flying Squad of London’s Metropolitan police. Based on the ’70s UK TV show. Story: The Sweeney starts as we see just how efficient DI Jack Regan (Winstone) and his team known as the Flying Squad taking down the criminals in any way they know how. Along with his team including rookie George Carter (Plan B) and the woman he is having a fling with DC Nancy Lewis (Atwell). After a group of criminals that leave one woman dead which leads to the Sweeney needing to get to the bottom of this crime by any means necessary, which will be the toughest case of Regan career with his boss DCI Haskins (Lewis) on his back. Characters/Performance – DI Jack Regan is a nonsense detective who always gets his man no matter how much he is risking making this happen while also balancing an affair with a young colleague. Carter is the youngest member of the unit and one that is destine to rise through the forces if he doesn’t follow in the footsteps of Regan. Nancy is the younger officers that is married but involved in an affair with Regan, she is a good cop and loyal to the unit. Winstone does suit this role with just how you could imagine the man fighting crime. Plan B is fine without excelling because you can tell he is not the fully trained actor with Hayley Atwell doing a good job. Story – The crime story is what you would have come to understand because it is just another one of these stories where rough cop who pushes the boundaries slightly too much faces his toughest crime to solve. It does have twists along the way but in the end, does have a very British street feeling about it all. Action/Crime – The action is all fine with a basic car chase down a country road and some wild shoot outs around London with the crime side of the story focusing on the idea this could be the toughest case Regan has faced. Settings – London makes for a great setting because it shows how tight knit the crime groups are as well as how difficult it could be o get to the truth for the cops. Final Thoughts – This is a gritty crime thriller that could be great but I feel the audience won’t quite enjoy it to the levels expected. Overall: Does everything I needs to for the small target audience. Story: Avengers: Age of Ultron starts by showing our Avengers Iron Man (Downey Jr), Thor (Hemsworth) Captain America (Evans) Hawkeye (Renner) Hulk (Ruffalo) and Black Widow (Johansson) trying to take down Hydra in Slovakia. We get to see how they are finally working as a unit, but when Hydra have hidden weapons with Quicksilver (Taylor-Johnson) and Scarlett Witch (Olsen) what looks like a simple missing takes a turn when Hawkeye gets injured, but more worrying Tony gets tricked by the Scarlett Witch as the mission looks like a success when the team collect Loki’s staff. Tony wants to use Loki’s Staff to create a dream peacekeeping system named Ultron. When Ultron takes over Jarvis we see its intentions are hostile and it decides that the only way to find peace would be to destroy all of the Avengers. Ultron reunites with Quicksilver and Scarlett Witch as they plan to eliminate the Avengers, while on the other side of the battles we watch how the Avengers look for clues to where Ultron is and what went wrong with the programming. Ultron continues its plan to take over the world and the Avengers have to regroup while going into hiding before figuring out the next plan of attack in the attempts to stop Ultron from destroying the world. Support Cast: Avengers: Age of Ultron has a mega supporting cast that includes plenty of familiar faces from the franchise popping up when the team need them. Worst Part: Seen the fights before. Action Scene Of The Film: Final one. Funniest Scene: The Hammer lifting. Oscar Chances: Could get a few for visual or special effects. Trivia: James Spader was Joss Whedon’s first and only choice for the role of Ultron, because of his “hypnotic voice that can be eerily calm and compelling while also being very human and humorous”. Overall: Avengers Age of Ultron is a glorified filler film, giving us a chance to see our favourite characters get another win over an unthreatening villain. 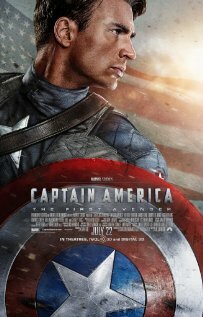 Story Steve Rogers (Evans) a small man who is trying his hardest to join the army so he can help in the war efforts. Steve is constantly getting reject because of his size, while his best friend James Barnes (Stan) joins the efforts. Going for another attempt Steve meets Dr. Abraham Erskins (Tucci) who gives him a chance. Colonel Chester Phillips (Lee Jones) is unsure of Rogers and wants a more built solider for the experiment. The doctor gets his way and showing how much he wants to be the best. Howard Stark (Cooper) has created a way to make a man stronger and a better solider Steve is the choice for this. After the experiment a German spy kills Erskins, Steve captures the spy but the spy takes his own life before questions can be asked. The spy is from the German group HYDRA led by Johann Schmidt (Weaving) and he is out to destroy the world with the power of the Gods. Steve has now become a sideshow hero performing in shows to collect money for the war. On a trip to the front line he learns of Barnes unit getting capture and with Stark and Peggy Carter (Atwell) he goes on a solo mission to save the soldiers. This mission will turn Steve Rogers into Captain America but can he save the day? Verdict Superhero movies were a plenty this year with X-Men First Class, Thor and Green Lantern. X-men and Thor were two of the best superhero movies around so this one had a lot to live up too, and honestly this is a good overall movie but not to the same level as the other two. The thing that makes this movie not meet that level is the fact there isn’t an original villain and not happens that makes you really go wow, like the boat and anchor scene in X-Men does. The level of action is good for the casual viewer looking for a movie you don’t have to think about. Another year this could have been the best superhero film and it would have been if it were up against The Green Lantern. Superhero fans should enjoy this origin story of Captain America. Star Performances Chris Evans shines in a role made for him. Dominic Cooper plays the Stark role perfectly can see how Tony turned out how he did. Favourite Character Howard Stark hard role to play after what Robert Downey created in Ironman as his son Ton Stark but this guy is just as mad and full of wise cracking one liners. Poor Performance Hugo Weaving this guy was Agent Smith in the Matrix and it looked like he never got out of that emotionless persona in a role that need some. Hayley Atwell she was unconvincing in this role, which seemed key to the story. Best Part Red Skull being revealed. Worst Part There could have been a lot more fight scenes instead of montages. Fun Trivia This is Chris Evans sixth comic book adaptation Fantastic Four 1,2, Push, The Loser and Scott Pilgrim Vs. the World.